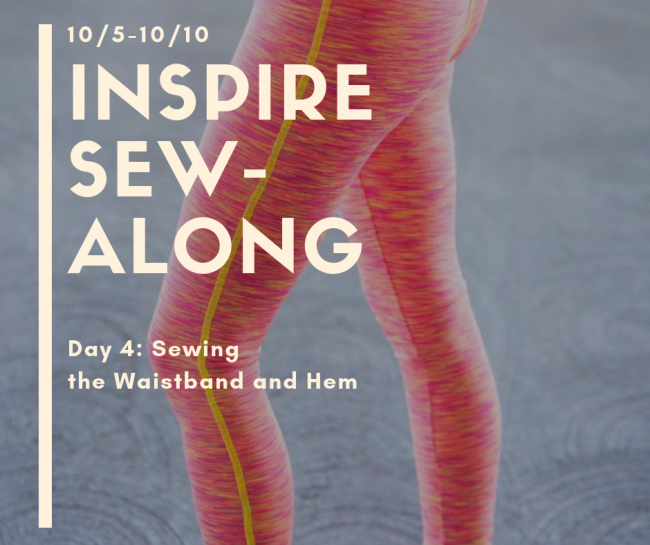 Welcome to Day 3 of the Inspire Tights SewAlong! Check out Day 1 HERE on the blog. It’s got lots of tips for selecting your size, adjusting your fit, and cutting your fabric! Day 3 is HERE on the blog. It includes a video covering everything you need to know for sewing in the triangle gusset! Today we will be finishing up our leggings by attaching our waistband and sewing the hem. This is where I tend to do alot of reverse cover stitching to get my seams nice and flat. If you want to check that out, you can find a tutorial on that HERE. Remember, its optional, so you can just sew them together as normal and not do any extra stitching if you don’t want to. Sewing clear elastic into your waistband is really important- every time I get lazy and skip it, I regret it! It really helps your leggings stay in place while you move around, and isn’t too bad to install once you get the hang of it! If you’re wondering where you can find this fun stuff, I buy the 1/4″ or 3/8″ from Amazon (because Amazon saves my life, #realmomtalk). That’s all folks! Tomorrow we will be finishing things up, and I’ll be choosing winners for our prizes on Friday! If you’ve enjoyed this sewalong, drop me a comment below- its always encouraging to know I’ve helped someone create their new favorite pair of leggings!